Android’s Always-On Display can be super useful for seeing information at a glance when you look at your phone. But it can also be super annoying because, well, your phone’s display is always on. But it doesn’t have to be this way. 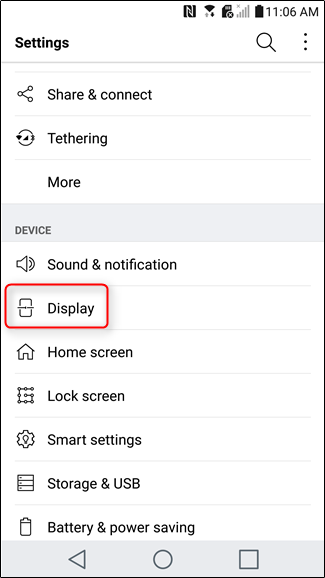 On stock Android, this feature is called Ambient Display, which is kind of like always-on display, except it’s not really on all the time. 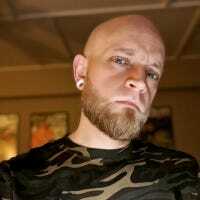 Other devices, like Samsung Galaxy devices and LG phones, use a different method, which literally leaves the display on 100% of the time by default. Fortunately, some of these devices allow you to tweak this setting. Others just allow you to toggle it on or off. Here’s what you need to know. 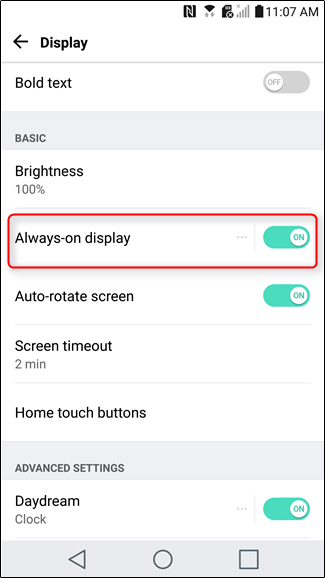 If you have a Samsung Galaxy phone, like the Galaxy S7 or S8, always-on display is enabled by default. While it doesn’t really drain much battery, it can be kind of distracting for your phone’s display to stay on all the time. Also, in true Samsung fashion, they don’t really make this setting easy to find—and it’s in a different place depending on whether you have the S7 or S8. Fun stuff. To tweak always-on display, first jump into the Settings menu by pulling down the notification shade and tapping the gear icon. 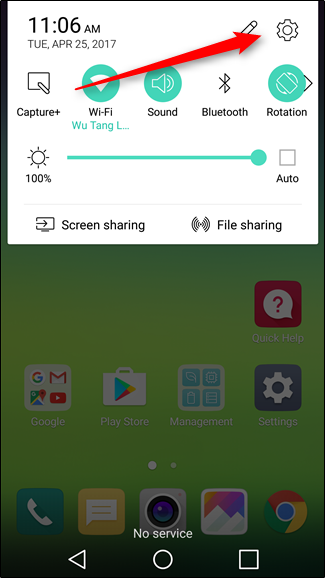 On the Galaxy S8, scroll down to “Lock Screen and Security” and tap into this menu. 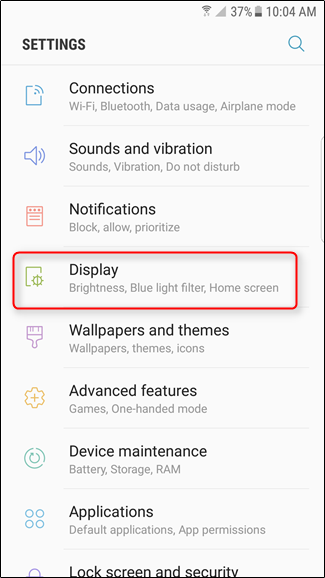 On the S7, tap into the “Display” menu. Scroll down either menu until you see a section for Always-on Display. There’s a toggle to the right side, so if you just want to disable it, flick that to off. Done. However, if you’d like to tweak how it works instead, tap the “Always On Display” text itself, which will toss you into a new menu. You’re given a few options here. On the S8, you can decide what content to show on the screen: “Home Button and Clock or Information,” “Clock or Information,” or “Home Button.” I’m honestly not sure why you’d want to just show the home button, but hey—it’s there if you want to use it. Otherwise, you can start tweaking the style of the Always-On layout. 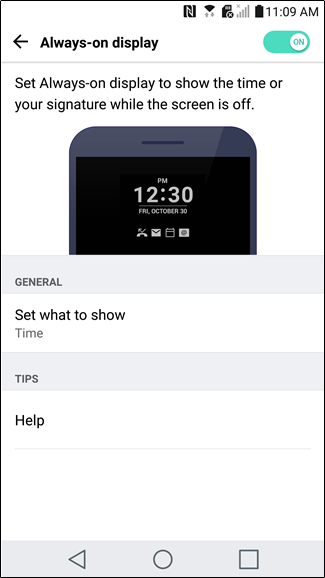 On the S8, the styles are shown on this page under the “Clock Style” subhead. 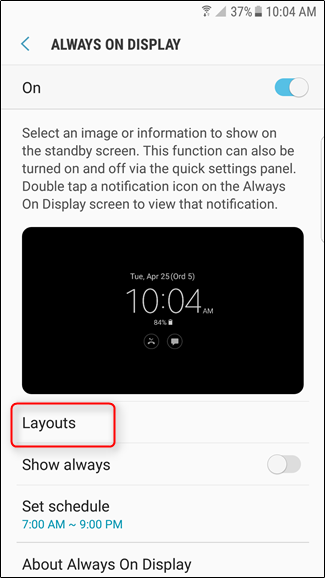 On the S7, you have to tap the “Layouts” menu to access these styles. You can also tweak whether or not Always On display is, um, always on, or if you want it on a timer. That’s a nice touch, because you don’t have to deal with it being on when you’re trying to sleep. Things are a little simpler on LG devices, because there aren’t really any options here—this feature is either on or off. To get started, pull down the notification shade and tap the gear icon. In the Settings menu, tap into the Display menu. Find the “Always-on Display” menu. To disable it, just flick the toggle. You can also tap the “Always-on Display” text, which will open the almost-naked settings menu. There’s one option here: Set What to Show. In this menu, you can choose to show the Clock or your signature. And that’s it.